All the way from the Gothenburg archipelago in the south to the Koster islands in the north, is a paddler’s paradise of marine national park, nature reserves, deserted isles, fishermen’s huts and clear blue waters. 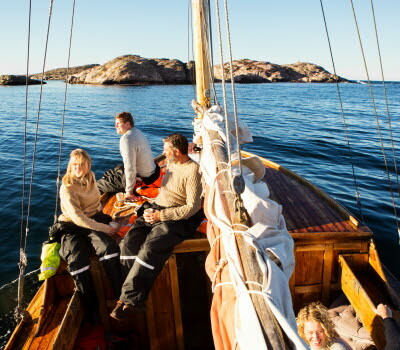 The Bohuslän coast and its islands is one of the top 10 last great wilderness areas in the world, according to CNN. We agree. This is Sweden’s first marine national park and takes in the Koster Sea and the Koster Islands; above and below the water line some 12,000 species live here. You take the ferry from the town of Strömstad out to your kayak pick up point. Given that the westerly Koster Islands lie out towards the open sea the kayaking conditions can be exposed, then again, if you have the weather on your side the kayaking is unbeatable. Non-kayaking activities include leaping from the rocks on the island of Ursholmen or exploring the beautiful bays on Måskär island. Guided and self-guided kayaking trips are available from Koster Trädgårdar, Skärgårdsidyllen and Upplevelsebolaget. Just south of the Koster islands lies the town of Grebbestad with outlying islands Pinnön and Otterön that provide shelter for kayakers. 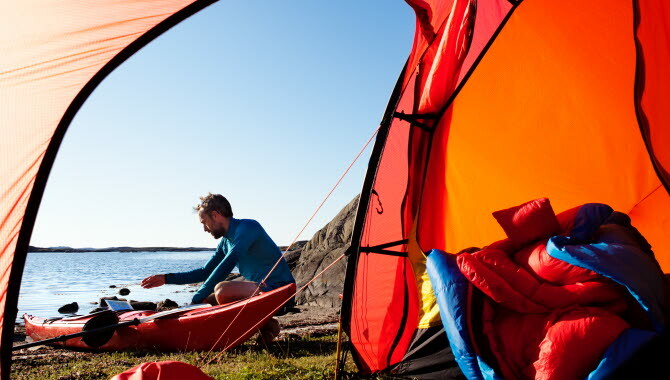 Make the trip south from Grebbestad by kayak to the Fjällbacka archipelago for crystal clear waters, rugged, rocky granite cliffs and fantastic kayaking. Don’t forget your mask and snorkel. Thirteen kilometres west of Fjällbacka town is the most westerly point in Sweden, the wonderfully named Weather Islands, or Väderöarna in Swedish. You can book a kayaking-stay-meals package with the Väderöarnas Guesthouse and Restaurant on the main island out here. Although the waters are easily navigable because of the lighthouses and pilot lookout points, ‘they are exposed and kayakers need to check the weather reports and be aware of the limit of their own abilities’ says Joakim Hermansson of kayak trip operator Upplevelsebolaget. The 365 island-strong Weather Islands became its own marine nature reserve in 2001 and together with the Koster islands is Sweden’s most species-rich ocean environment. Out here there is a large colony of harbour seals, as well as flocks of skua, shags and black guillemot. 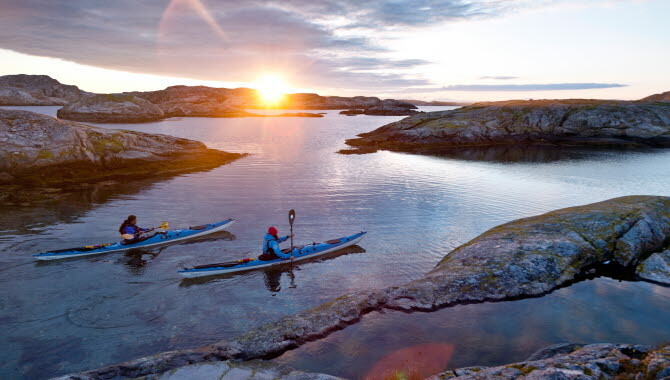 Among the companies that operate guided and self-guided kayaking trips out to the Fjällbacka and Grebbestad archipelagos, as well as the Weather Islands, are Upplevelsebolaget, Nautopp , Minto and Skärgårdsidyllen. It’s easy to get excited about the coastline as it continues south, with its channels and smaller islands. 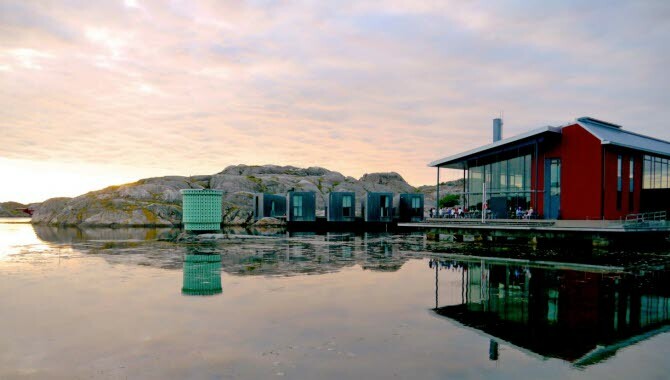 The Lysekil archipelago offers Sweden’s wildest kayaking waters and operator Grundsund Kayak Center offers year-round kayaking here. 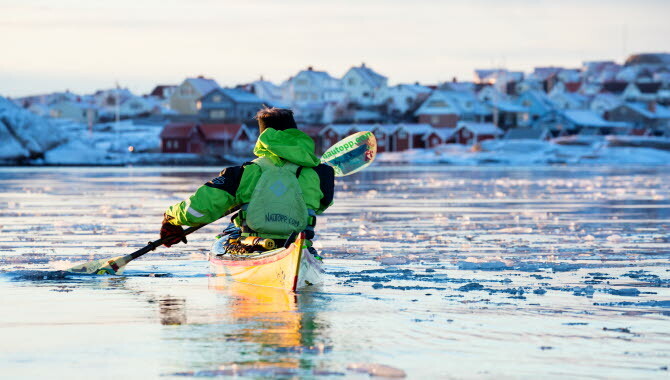 Come for a course in winter kayaking. Don’t miss out on visitor favourite Brandskär or the majestic, smooth rocky cliffs of Bläckhall. 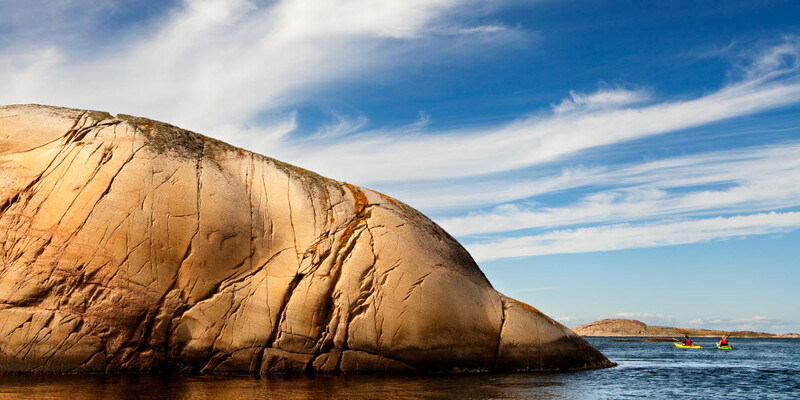 For a longer trip head south to Gåsön island in the Grundsunds archipelago for its rock cliff walls shaped by time and the sea over thousands of years. Further south the fjords around the island of Orust offer kayakers to chance to glide through the still waters. If you fancy going west of Orust pay a visit to Gullholmen before continuing south through an island-packed archipelago, passing by Hälleviksstrand towards Mollösund. If the weather is fine a stop-off on the island of Käringön is a must. Kayak tour operator Upplevelsebolaget is based in nearby Uddevalla. 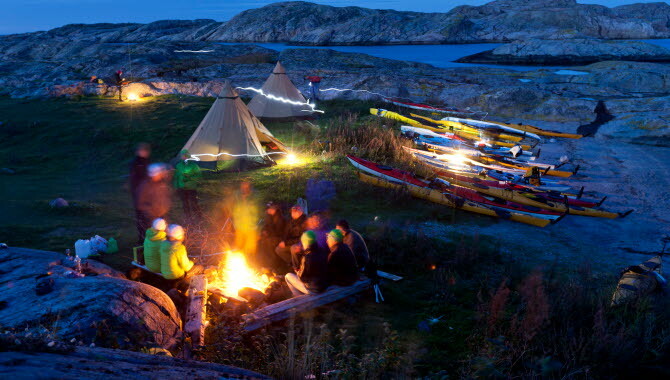 You can mix kayaking with culinary experiences by paddling to Klädesholmen island, a former fishing community. 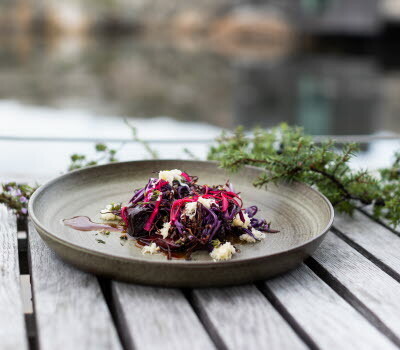 The houses here are packed like sardines, or herring as they say down here, as this humble fish was the mainstay of Klädesholmen and the entire Bohuslän coast for hundreds of years. And herring, as well as other delicacies are served in the several quality restaurants here. 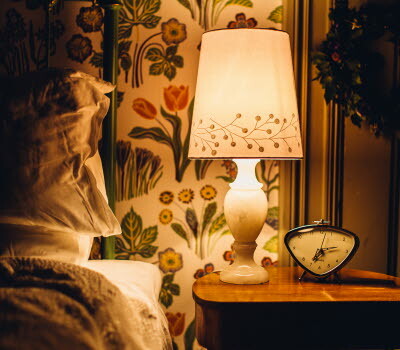 How about some art – paddle over to the village of Skärhamn for the Nordic Water Colour Museum. If you have time visit the inner archipelago of Stigfjorden between Tjörn and Orust. There are a bunch of islands and bays here that you can only get to by kayak. Marstrand island and the Gothenburg archipelago tend to get overlooked and there is no good reason why. If fact there are some very good reasons to kayak here, one is the natural beauty of the area, another is the small fishing villages you can visit on the islands. Stay leeward of the islands for some relaxing paddling or go windward because you can. Kayaking on the west coast has something for everyone and for beginners and experts alike. There’s the Bohuslän coast and islands, the history and the culture and the activities on offer. There are the expert kayak trip operators, known internationally, who will expertly arrange and operate guided and self-guided trips, as well as learner and advance courses. Discover kayaking here for yourself, or book single day and multi-day trips with all-inclusive and premium packages with an expert guide. These companies are staffed by highly qualified and expert Swedish and international instructors and guides. Five tips about kayaking on the west coast. Weather-wise July is the best month to come kayaking on the west coast, but it also the busiest month of the year as it is the Swedish holiday season. At the end of August and the month of September you can have the archipelago to yourself and May and June are also brilliant months to come. Take a lot of drinking water on your trip. 1.5 litre bottles are easy to pack and always take more than you think you will need. 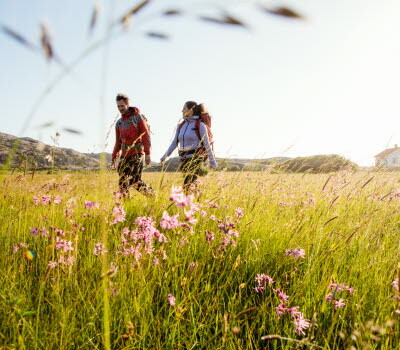 Ask your trip operator about the best routes and camping spots. During certain periods of the year you are not allowed to go on some of the islands to protect the bird species and seals. Sun protection – very, very important. Protect your skin with a high factor sun cream or block and cover up exposed areas. Headgear, such as a cap, is always a good idea.